I absolutely love this dosa recipe! It’s a delicious savory gluten-free crepe. If you live in a cold climate, you may find this dosa batter easier to work with than the dosa batter made from urad dal, as the pesarattu dosa batter doesn’t need to be fermented. Once you soak the moong dal (mung beans) and rice overnight, it only takes a few minutes to make. Place the rice, mung beans, chilis, ginger and salt into your high speed blender, and you’ve got batter ready within a few minutes! Try it with our peanut chutney recipe! 1. Soak both lentils and rice separately for 6 hours or overnight. Use 1.5 cups of water for the lentils and ¾ cup of water for the rice. 2. After soaking, drain the water from lentils. Drain the rice and keep the rice soak water to blend the batter (it contains some good nutrients). 3. Place the drained lentils and rice in your high speed blender. Add the chilis, ginger, and salt. Add the soak water plus any additional water needed to cover. (Note: you can process in two batches if needed). Process until the texture is like a thick soup. Add more water if needed. (Careful: texture should not be thin and watery). Set aside in a large bowl. Repeat with the second batch of ingredients and add to the large bowl. 4. Heat the frying pan or griddle to med-high until a drop of water sizzles and evaporates immediately: the pan should be quite hot. For the first dosa, spread a few drops of oil over the surface with a folded paper towel. (You want a thin layer of oil covering the pan the before you pour the batter if your pan doesn’t have a non-stick surface or is older. (For the 2nd dosa onward, only simply wipe off the extra oil with a paper towel). 5. Scoop one ladle of the liquid dosa batter into the pan, spreading the batter quickly in a circular motion towards the edge of the page. It should be very thin – like a crepe. (Add an optional ½ tsp of oil on top of the dosa). Cook for 2-3 minutes until the edges begin to curl. You’ll see the top side of the dosa (facing you) begin to get brown as the bottom of the dosa cooks and browns. Once the bottom of the dosa looks golden brown and the edges are curled, flip the dosa and cook for another 1-2 minutes until golden brown. 6. Once cooked, transfer to a plate and eat while hot. It’s delicious served with peanut chutney and chopped sautéed onion. Enjoy and Namaste! Note: for best results, after each dosa is cooked, take the folded paper towel and wipe the pan to spread out any excess leftover oil from the previous dosa before adding more batter. Any unused batter may be stored in the fridge for up to a week. ** Instructions for sprouting moong lentils/ mung beans: After a 6 hour or overnight soak, they will double in size. From this point on, drain so there is just enough water to cover them. Having too much water will drowning them and might might not give good sprouting results. To encourage sprouting, wrap the 6 hour soaked lentils in a muslin cloth and keep the cloth wet for the next 24 hours. 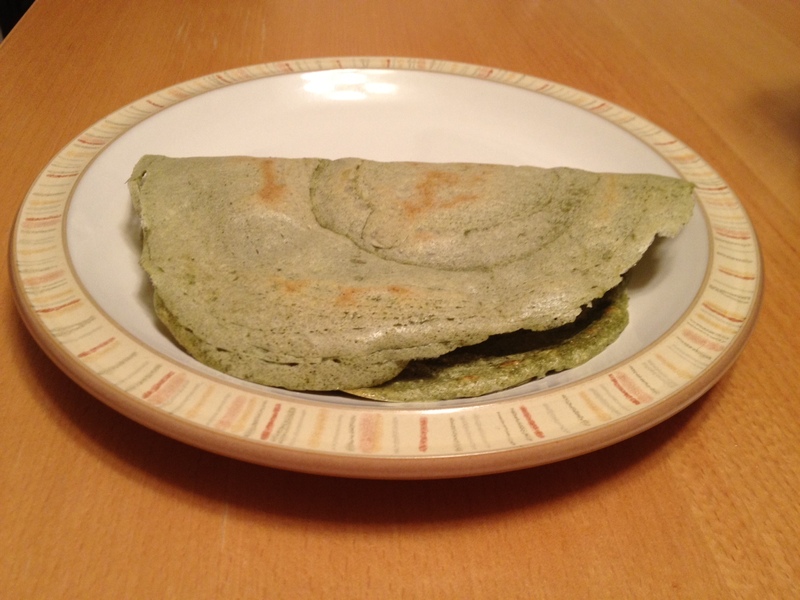 Let us know what you think of this easy vegan recipe: Pesarattu (Mung bean and rice crepe)!